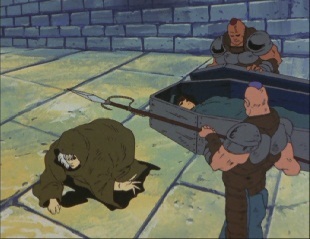 Shachi is dragging the coffin across a desert. 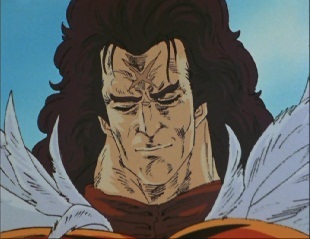 The heat is getting to him but he continues on his way, still believing in Kenshiro and that he must be the only one who can defeat Kaioh. 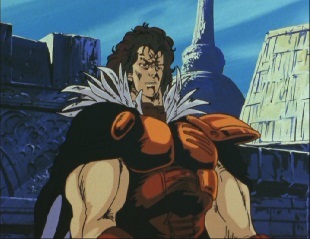 Meanwhile, Kaioh has returned to his palace and thinks about what happened earlier. 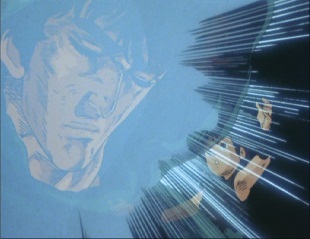 It was exactly what he was afraid of -Kenshiro seemed to be summoning the power of Hokuto Soukei. 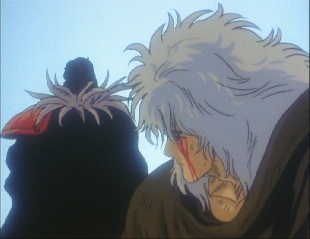 It is even more important now for him to die than it was before. 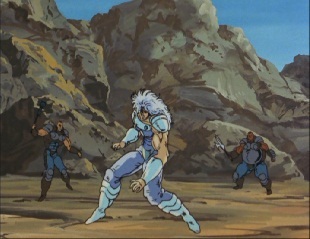 A guard runs in and Kaioh turns his attention to another important matter: Lin has gone missing, and he wants her back. Having been swept away by a current, Lin has traveled though the channel and comes to a small but solid piece of land. 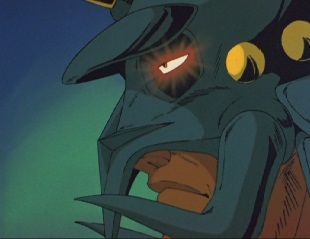 However many of Kaioh's troops are out looking for her. She wakes up just in time to hear some guards heading her way. 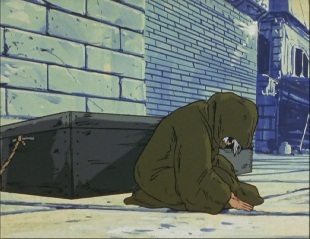 There is only a small pipe for her to take cover behind and she overhears the guards talking about Shachi and how he saved Kenshiro. 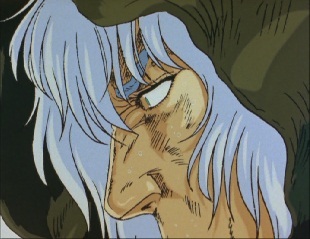 She realises that Shachi may not actually be that bad after all. 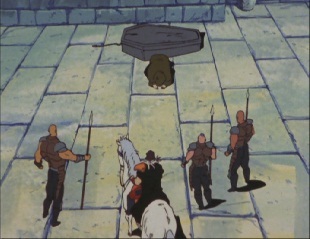 The guards keep advancing though, so she has to make a run for it and heads up a ladder. 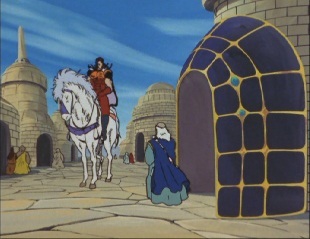 She climbs up and out into a building, but a Shura is right behind and tells her to stop! 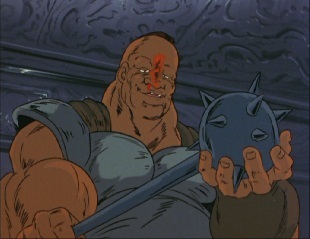 Lin happens to find some weapons on a wall next to her, so the Shura gets a mace to his face. 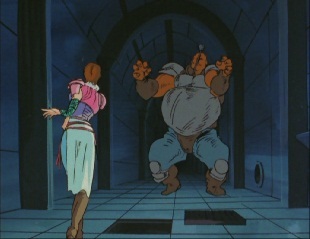 But he survives and lunges at her, only for her to simply trip him up. 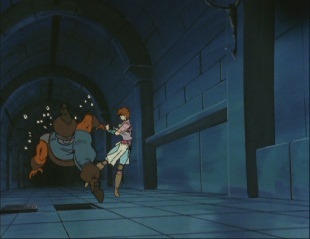 Lin runs through the castle trying to find an exit, but soon other Shura corner her outside of a door. 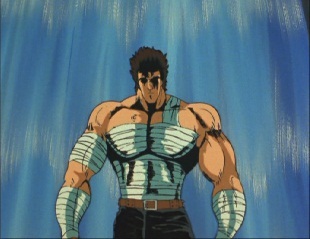 The injured Shura says that before he takes her back to Kaioh, he'll beat her up a bit first for revenge. Just as he is about to hit her, the door behind Lin opens and out steps Sayaka, who wants to know what all the noise is about. 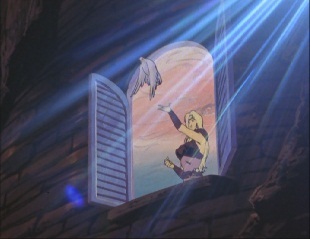 She sees Lin and takes pity on her, telling her to go inside. 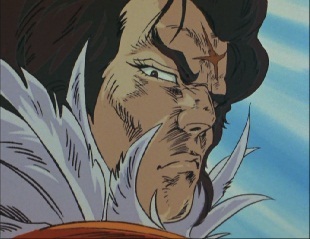 The Shura apparently don't dare mess with Sayaka, but they say they need to take Lin and obey Kaioh, even if she is Kaioh's sister! She doesn't care about them though, and she shuts the door in their faces. 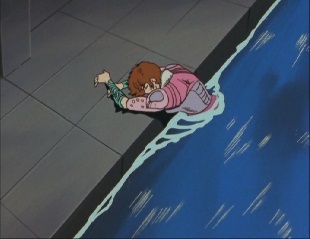 Sayaka apologizes to Lin as she isn't sure why her brother is after her, but she is certain that he has treated her horribly. 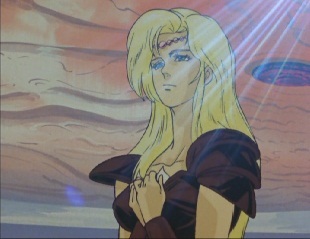 She says that whilst Kaioh has gone down the evil path, she believes that one day he will return back to normal and on that day the land of Shura will be at peace again. A carrier pigeon then comes in and Sayaka rushes over to it to excitedly read the message. 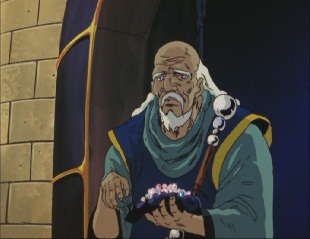 It turns out that Hyo is coming to the castle! Hyo is on his way, but he's also doing a little shopping. He visits a small village and goes to collect something he ordered -in this case, jewels. The shop keeper is sure that Sayaka will like them. 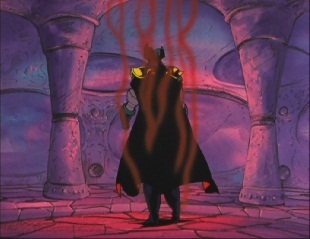 Hyo thanks him and says that he should come by his castle later, he can have any reward he wants for this. 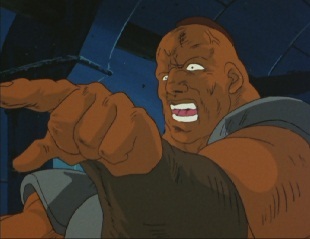 Hyo then rides on. 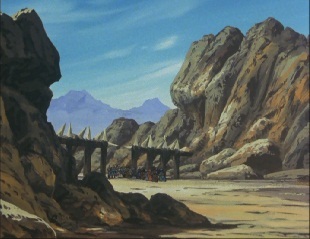 Meanwhile the Shura have set up some outposts and are making sure any travelers aren't the injured Kenshiro trying to get away. Shachi has to get past one of these and whilst the Shura are fine with letting him pass, things turn ugly when they want to check the coffin. 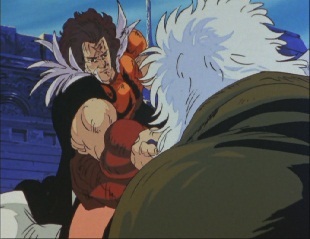 Shachi has to stop pretending to be a boro and attack the Shura. 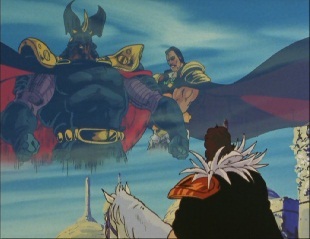 Shachi tells the Shura he is the one known as Rasetsu, and he will destroy them all. 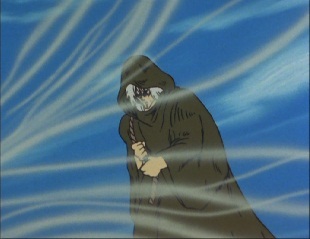 As he says this, nobody seems to notice that there is someone watching what is going on from a cliff above. 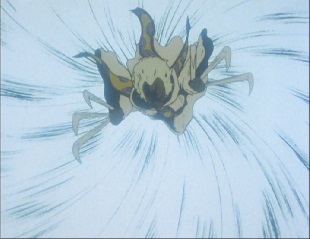 Shachi starts his attack, and defeats several Shura, but he has to stop suddenly. 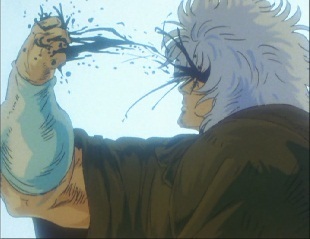 The injuries he got when Kaioh attacked him are still quite painful. 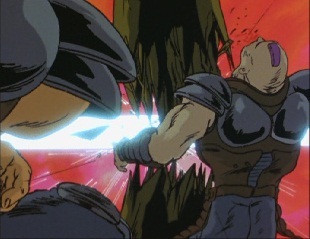 One of the Shura starts wielding a mace around and nearly hits Shachi with it. 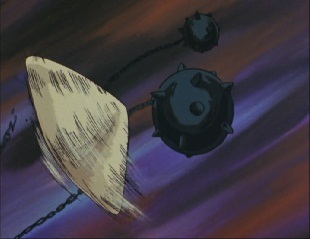 He uses it again, only for his weapon to be destroyed when a hat slices through the chains. 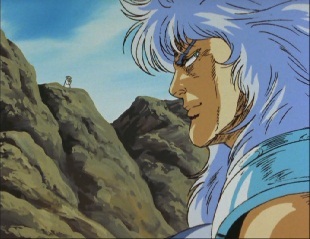 The man watching from the cliff has decided to enter the battle! 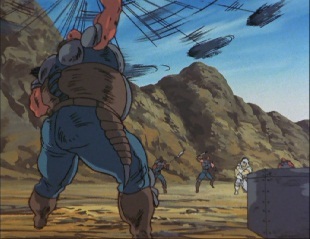 He takes down most of the Shura and destroys part of their outpost. 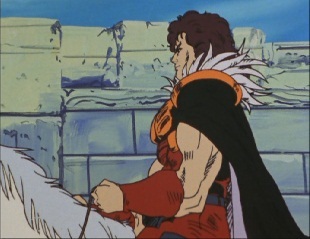 Only the leader Shura is left, who tries to back away, but then goes to attack. 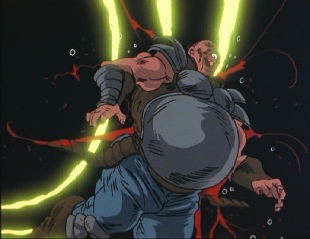 Only his strike misses as the man jumps over him and then slashes into his back. 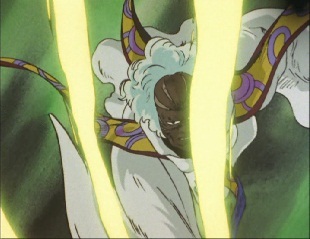 Shachi asks him what his name is, and he finds out that his helper is called Kuroyasha. 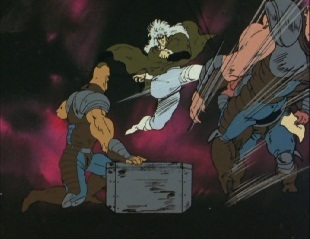 He tells Shachi to protect the man in the coffin before leaping away. 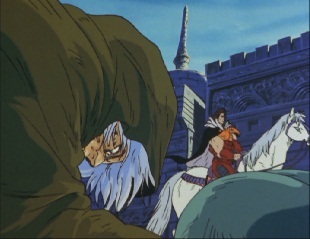 Shachi continues on and despite being exhausted, he finally makes it to the village he wanted to get to. 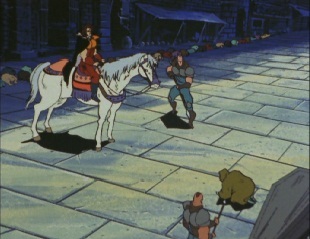 But then disaster strikes where he hears some troops telling all the villagers to bow down as a Rasho is heading through the village! 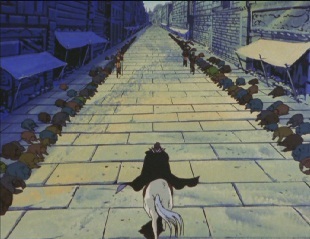 Soon enough, Hyo starts to ride down the streets. 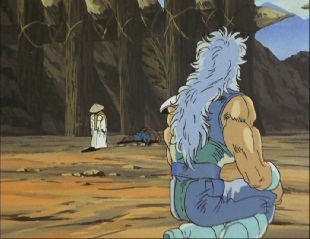 Shachi hasn't got time to move out of the way so he kneels and hopes that Hyo won't see him. 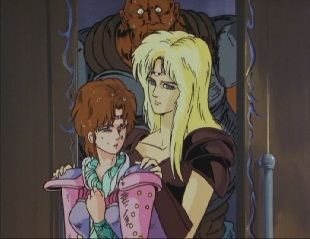 It looks like he is going to get away with it when Hyo suddenly stops and tells Shachi to show him his eyes. 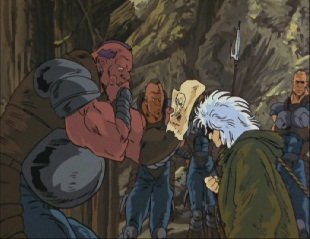 The other villagers run as Hyo and his troops surround Shachi, meaning there really is no escape for him this time. 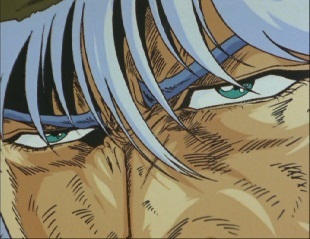 When Hyo looks into Shachi's eyes, he says that his are different to the other boro's and that he cannot be one. 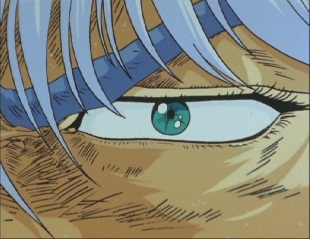 His eyes glow brightly and are full of energy, which he's never seen before, at least in a boro. 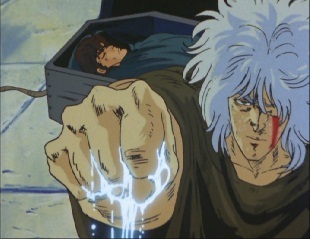 He then takes interest in the coffin and even though Shachi explains that it contains his dead friend, Hyo's troops open it up and sure enough, the seemingly dead Kenshiro is inside it. 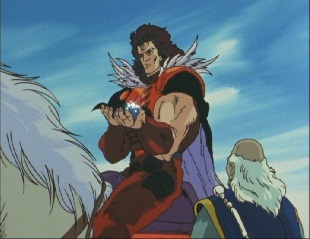 ...then allow me to present them to you, Lord Hyo!" 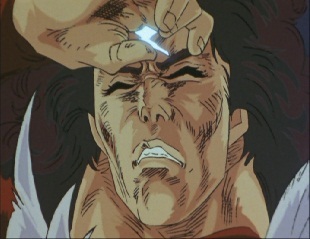 Shachi plunges his fingers into his left eye and removes it. 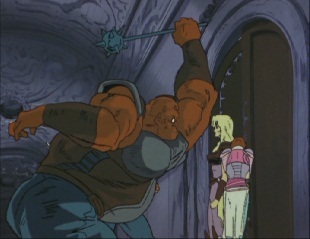 He asks the stunned Hyo if that is enough, and Hyo then has to stop him from removing the other one. 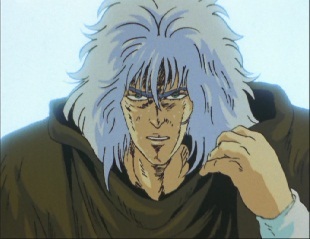 Hyo has seen enough, but asks Shachi one last question: how much does his dead friend mean to him? All Hyo can think about suddenly is the man in the coffin. 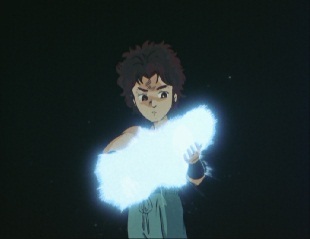 He then sees a younger version of himself holding something, which he casts into the air...and it turns into the man in the coffin again! 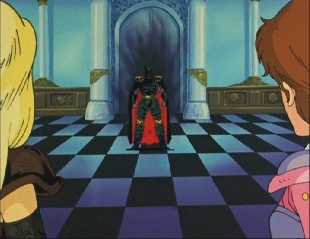 Hyo looks behind him but Shachi is gone, as is the coffin. 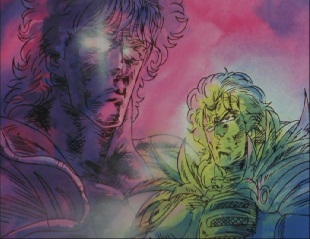 He wonders if that man could be his brother, Kenshiro! 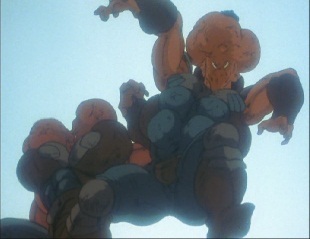 But he then laughs it off and thinks that he only has 2 people he considers brothers: Kaioh and Han. 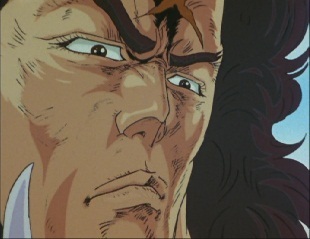 Kenshiro is the greatest enemy of Hokuto Ryuuken, so therefore, he must die! 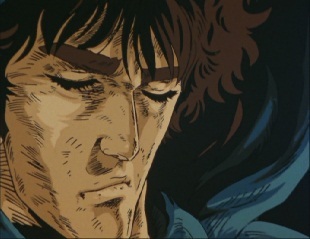 Will Kenshiro wake up? 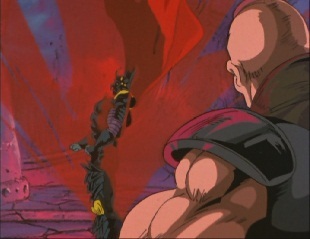 And how far does Kaioh intend to go to destroy Hokuto Soukei? 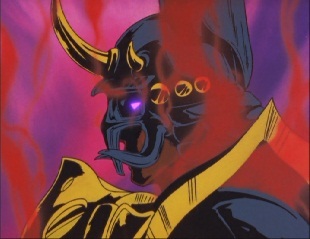 Find out in "Majin Kaioh's Choice! 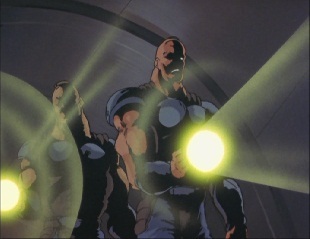 Cold Blood Runs Through my Body!!"